Although critics of wind power suggest that wind is a variable energy source and can’t be relied upon to keep the lights on, this isn’t actually the case when wind power is distributed over a large area like the North Sea. Variations in production at one wind park can be partly balanced by that of another park several hundreds of kilometres away. To demonstrate this concept, Greenpeace commissioned a report based on what would happen if real wind speeds over the North Sea were applied to more than 100 envisioned wind power projects with 10,000 turbines. If all projects from Belgium, Denmark, France, Germany, Great Britain, Netherlands and Norway were built there would be an installed capacity of 68.4Gw. 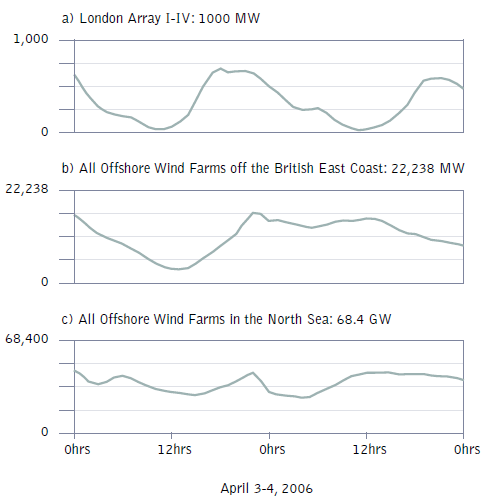 The top graph below shows how the power output of the propose London Array would fluctuate with changing wind speeds. When combined with all wind farms around the British east coast, the power production starts to level out as a dip in generation around London could be offset by heavy winds around Scotland. The final graph shows how wind production stabilises even more when combining all wind farm output from countries bordering the North Sea. 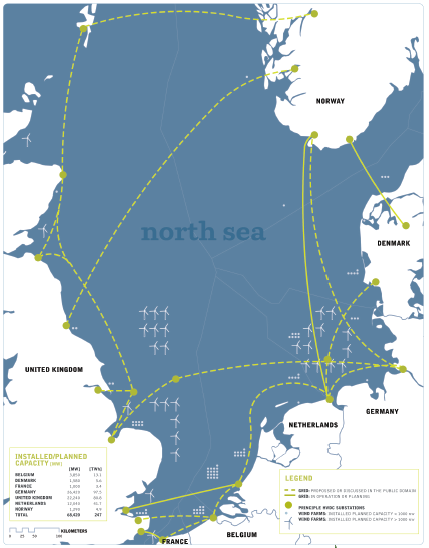 To capitalise on the balancing nature of distributed wind farms, a large North Sea grid spanning 3,850 miles would be required to connect all of the wind farms together. Such a grid would facilitate trade and increase security of supply by dispatching power from offshore wind farms to different countries depending on the highest demand. Moreover, an offshore grid allows the import of electricity from Norwegian hydro power plants to Britain and other countries. For some hydro plants, excess power (when the wind blows and sun shines) can even be used to pump water back into reservoirs, working like a huge water-battery. Biomass from European countries could also be fed into this grid. A system of this nature with many thousands of wind turbines is more reliable, and energy production more secure because the impact of maintenance or defects will be negligible when compared to a large coal or nuclear plant going off line. Another advantage of a North Sea grid is that any future wave power, floating wind Turbines and tidal power stations could also be connected up to provide more power, stability and distribution of power between countries. If this proposal were to be implemented then 70 million homes or 13% of the annual electricity consumption of the seven European countries could be met.